Gunlock Reservoir is located 15 miles northwest of St. George. The reservoir was originally constructed for irrigation and flood control, but it is also a popular boating, water sports, and fishing destination. 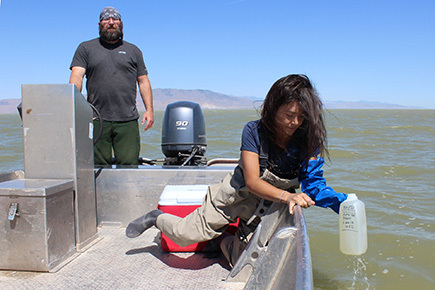 The Division of Water Quality (DWQ) visited Gunlock Reservoir on August 8, 2019. 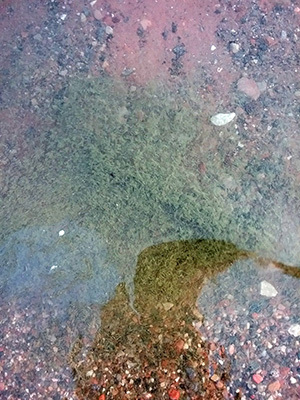 The monitoring crew noticed a small bloom along the shore near the boat launch on the southeast end of the reservoir. The crew collected surface samples at this location. Toxin strip results were non-detect for both anatoxin-a and microcystin.